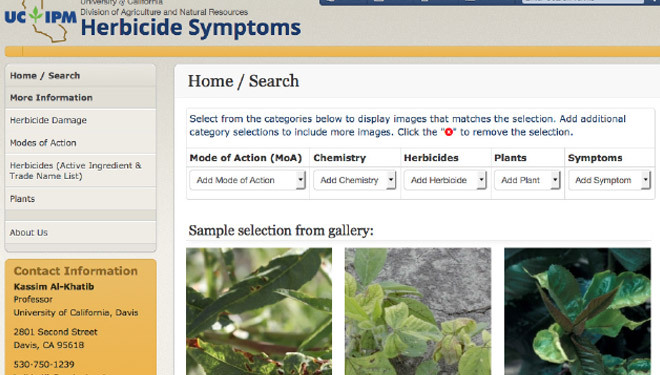 Identifying non target crop and ornamental plant damage from herbicides has become much easier, with the launch of a new online photo repository by the Statewide IPM Program, University of California Division of Agriculture and Natural Resources. Figure 1: Snapshot from the Herbicide Repository. Dr. Kassim Al-Khatib, weed science professor at UC Davis and director of the UC Statewide Integrated Pest Management Program (UC IPM), has gathered nearly a thousand photos of herbicide-damaged plants, drawn from his own and others’ research. The images are cataloged to show damage that can occur from 81 herbicides in more than 14 specific herbicide modes of action, applied in field to demonstrate the symptoms or when known herbicide spray has drifted onto the plant. Each image is characterized with the name of the plant, mode of action of the herbicide, and notes the specific symptoms of damage. Together these photos provide a comprehensive archive of damage to over 120 different crops and ornamental plants by known herbicides, which users can easily compare with what they see in the field.